APR 15, 14 .. 'ZILLA SILLINESS .. A LITTLE SILLY FUN ON 'TAX DAY' ..
MY NAME IS BLAZE ! I'M A MIGHTY DRAGON ! WELL HELLO TO YOU BLAZE! Welcome to our little web site here. BLAZE .. let me introduce you to our followers. In the lower south east corner of the State of California here on the West Coast of the United States of America there is a city named Ontario. If you find the city of Los Angeles on a map and go east out Interstate Highway 10 (I-10) you will find the city of Ontario just south of I-10. The city of Ontario has an Ice Hockey team named the Ontario Reign. Our local team .. the Alaska Aces .. play the Ontario Reign and Patti and I go to the stadium and watch the games live-and-in-person. Our home town Alaska Aces and the Ontario Reign are arch rivals in their ice hockey league and indeed rank 1st (the Aces) and 2nd (the Reign) in the standings. The two finished the regular season literally in a dead-tie with the Aces just a fraction of a point ahead of the Reign. The league playoffs begin this Friday the 18th and the Aces and the Reign may well meet in the western conference finals. My friend 'Zilla lives north of the city of Ontario up in the California high desert. 'Zilla .. like Patti and myself .. enjoys ice hockey and attends the games of his 'home team' the Ontario Reign. So what-to-my-wondering-eyes-should-appear yesterday but a small package from my buddy 'Zilla. Upon opening 'Zilla's package .. with a big smile .. out-pops BLAZE! "HI DAD! I AM BLAZE! I AM THE MASCOT OF THE ONTARIO REIGN ICE HOCKEY TEAM AND 'ZILLA SENT ME TO YOU DAD!" And I thought to myself ..
NIFTY 'ZILLA .. but ..
Blaze you are indeed a handsome little rascal and 'Zilla is my friend of 38-years .. BUT what on this good earth am I going to do with you! Little Buddy .. ol' Bobba Caps does NOT need a member of the Ontario Reign .. the Aces arch rival .. living here with Patti and myself in our condo in Anchorage! And then I thought of Riley .. the grandson of Chris a very close friend of Patti and myself! HELLO RILEY .. here is a little present! That is Patti in the red assisting Riley ..
Well hello BLAZE smiles Riley! Grandma Chris .. also known to Riley as 'GiGi' .. in the black shirt below is looking on. Hi Dad .. I think that this-works-for-me .. /s/ BLAZE ..
'Grandma Chris' .. her eye-glasses on .. is sure 'checking-out' BLAZE! You won't lead my grandson astray towards the Ontario Reign now will you BLAZE? We here in Anchorage are Alaska Aces fans .. got it BLAZE? Dream-on Lady! I am the mighty BLAZE! TO FEEL GOOD .. DO GOOD! And my man 'Zilla .. you have sure made one young man feel very happy about his new buddy BLAZE. As I sit here .. I get a little bit choked up as I ponder the fact that far away in India .. a child may well be following along here .. eagerly checking a map of the United States to see where California and Ontario are .. wondering what ice hockey is .. and fascinated with BLAZE. Oh God of Abraham .. I feel so truly and I feel so deeply blessed by You! Thank You for your Grace! I Love You! I Worship You! .. /s/ .. Your Little Captain ..
APR 10, 14 .. WINTER CONTINUES WITH ' BREAK-UP ' IN PROGRESS .. In Alaska we call the time-of-year when winter transitions into spring 'Break Up' . Right at this moment we are deep into it. Most Alaskans just accept 'Break Up' for what it is .. a step in the yearly cycle of winter to spring. Some Alaskans however ABSOLUTELY HATE 'Break Up'. Sometimes it is one step forward .. and then one step backward. The photos immediately below show our back yard. Progress and regression. We are trying to get to the warm-weather beauty that you see immediately below. Oh it's a long long way .. from May to December .. but we are into April. This morning it was +10 F (or -12C) so the snow is hanging on strongly with cool nights. Then we wake up one morning and we have regressed a step or two with a 'light' overnight snowfall. Then we have the beauty issue. Pure white snow in piles is very beautiful especially with the brilliant sun. BUT when the sun is hidden and the snow is melting we find a much different ambiance! OH YES WE ARE MAKING PROGRESS AS YOU CAN SEE IN THE BELOW (BEFORE) AND (CURRENT) PHOTOS! Note in the above and the below photos how white and beautiful the snow alongside of the road is. VOILA! REAL SNOW-MELT PROGRESS! In the below photo we can now clearly see our road and driving is much more relaxed. Notice in the below photo how 'dirty' the snow has become. I just wanted to show you a few photos showing Alaska 'Break Up' live and up-close. If you want to take a short road-trip .. or even a long road-trip .. from Anchorage Alaska .. you have two choices. You drive North up the Glenn Highway or you drive South down the Seward Highway. That is it! If you drive South you will pass some incredible scenery as you motor along the Turnagain Arm of Cook Inlet. As you motor South down the Seward Highway .. you come to McHugh Creek State Park. The word Chugach that you see on the below signs is the name of the Chugach Mountain Range South of Anchorage. In mid-March we still had quite a bit of snow on the roads. 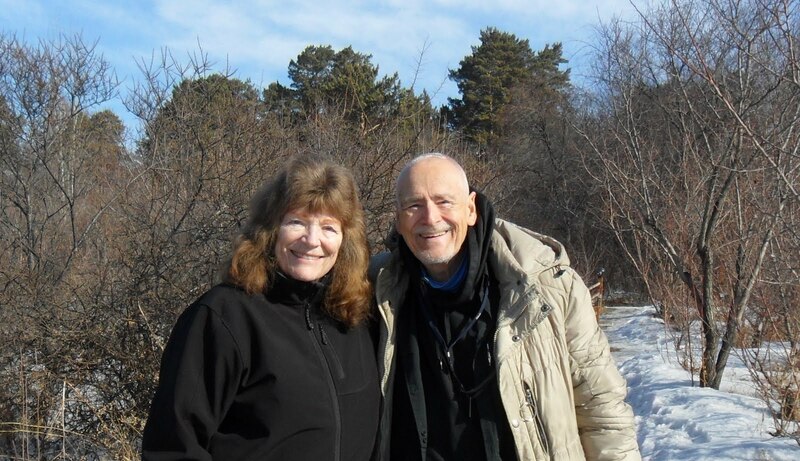 Smiles from the two of us .. Cap and Patti ..
Continue to 'scroll-down' to see Part II of this two-part series of posts. The photos taken in Part I above were snapped in mid-March. Yesterday .. Thursday the 3rd of April .. Patti and I took another drive South down the Turnagain Arm of Cook Inlet. In going down the below photos .. you will see that there is far less snow-on-the-ground than you see in the below photo from Part I above! You want 'powerlessness'? Get a web site! NOW I am able to post all the photos in extra-large size. It has been some months since I have been able to do this. And please don't ask-me-why some of the below photos look 'touched-up' and more like paintings .. and some look more normal. All were uploaded as-taken with my camera. Go Figure! Lack of power .. that was our dilemma! Below are the photos that we snapped yesterday .. April 3rd. The below photo almost looks like a moon-light photo. As you motor South down Turnagain Arm you come to a touching memorial to Mr. Kerry Brookman .. an Alaska State Employee who was killed on February 1, 2000 when he was engulfed by an avalanche near this location. Patti and I often stop to pay homage to Mr. Brookman. I am a great-one to 'go-back' if we pass an interesting photo opportunity. Below is one-such-example. As Patti and I drove past I exclaimed "Did you see that?" Patti and I never .. as in NEVER EVER .. tire of the beauty along the Turnagain Arm of Cook Inlet as we motor South down the Seward Highway. The two-of-us hope that you have enjoyed the above photos in these two posts.